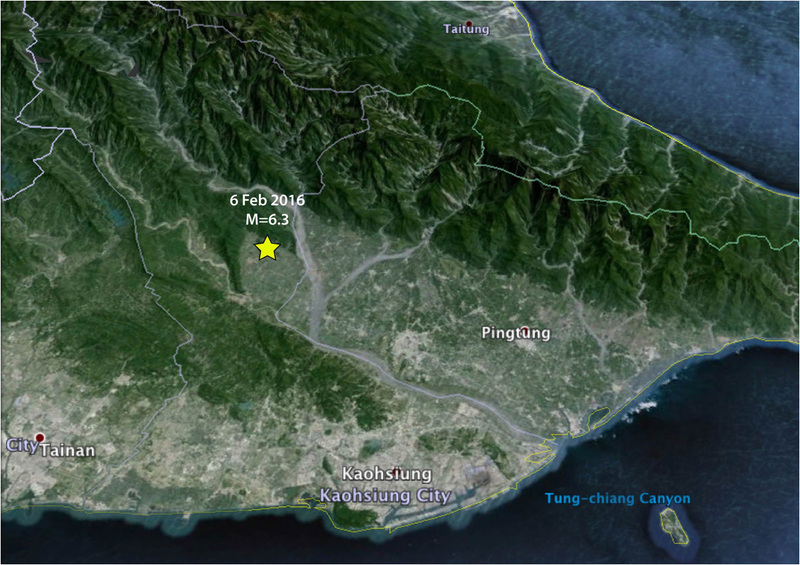 The Chaochou fault marks the razor-sharp boundary between the Central Ranges at the top of this oblique Google Earth image from the Pingtung Plain in the center. Because the fault is almost 100 km (60 mi) long, it is likely capable of a M=7.2 earthquake. The image is oriented with North to the upper left. The city of Tainan is in the lower left. The fault was elucidated in the landmark study of J. Bruce H. Shyu, Kerry Sieh, Yue-Gau Chen, and Char-Shine Liu, ‘Neotectonic architecture of Taiwan and its implications for future large earthquakes,’ J. Geophys. Res., doi:10.1029/2004JB003251 (2005).